Most of our website hosting is controlled by a program called CPanel. 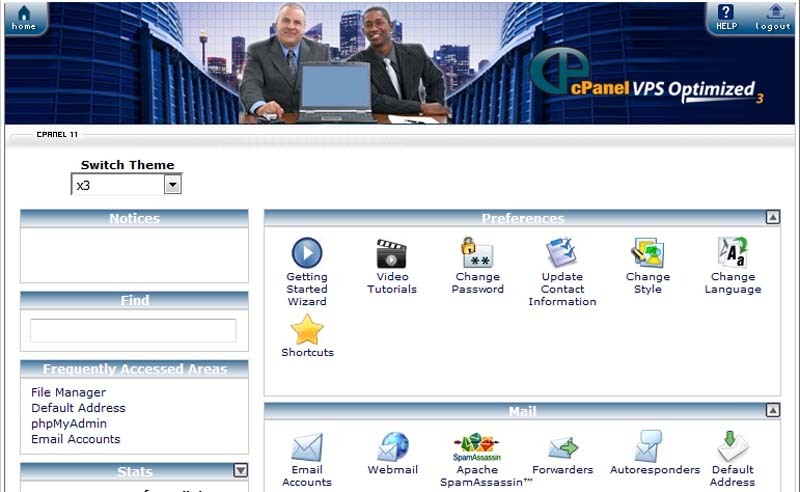 CPanel is an easy-to-use customer-interface website that allows you to control many aspects of your host account. The main feature of this operating system is that it so simple to use even for beginners with only basic computing knowledge. Most browsers such as IE, Opera, Firefox and Chrome support CPanel. Some of the features embedded into CPanel are listed below. There are such tools available for your use, which are Web Protect (.htaccess editor), Custom error pages, Redirects, Ability to edit MIME types, Ability to edit Apache handlers, Install/Uninstall FrontPage Extensions, Search engine tool submitter plus File Manager. The email program provides the ability to add, remove, and change passwords while managing email accounts while Webmail, Auto responders, Forwarders, Mailing Lists, Spam filtering is also catered for. Backup allows you to create copies of account files and databases. The backup menu allows you to access any automatic backups that were downloaded by the CPanel administrator. There are different tools to analyse your site popularity and efficiency. Those are Webalizer web stats, Webalizer FTP stats, Analog stats, AWStats, View latest visitors, View bandwidth usage and View error log modules. A module exists to control FTP accounts (add, remove, change password for its access), Anonymous FTP controls; Ability to change FTP login message and Ability to kill FTP sessions. A selection of tools exists for the advanced level user. If you want to Hire Our Developers to complete small tasks for you, this package might suit. When we develop your website using WordPress, a lot of these tools can be integrated into your wordpress administrator panel. Contact us if you want to know what features are available and what can be included in your website.